The big winner? Whoever the one person was that voted their church as we’re thought-out and written-up like the Smithsonian. Speak up in the comments; share your strategy; let’s hear it! And the other group of you on the same track are the 10% who have devised a strategy, but now you’re executing. We’d love to hear what went into your plan and how the execution is going thus far. And what of the non-planners? 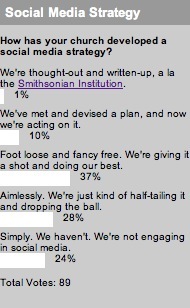 37% of you are flying foot loose and fancy free. You jumped into social media, and now you’re just trying to engage in conversations and keep your head above water. The next couple chunks of you aren’t having the most social media success. 28% are trying your hand at social media, but you’re wandering aimlessly and failing slowly. We’d love to hear where you’ve run into problems and what they were; perhaps you can help other churches with your story. Another 24% of you are simply not engaging in social media. Do you feel like you can’t give full effort, so you might as well not try? Just don’t see the value proposition? Feeling lazy? We’d love to hear why you’re not giving it a shot. Do you think that church’s lack of engagement in social media is a WILL or a SKILL problem? – A will problem = We don’t see how this is relevant to the life of the church or we are afraid so we won’t try. – A skill problem = We don’t know what to do. We are so overwhelmed we don’t know where to start and how to do it right. I think an interesting poll question to follow up on these results would be ask about the biggest challenges they face focused on skill and motivation factors.